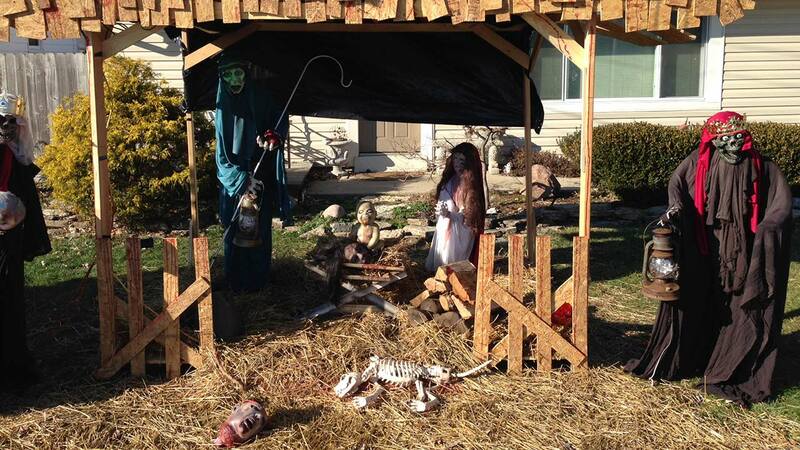 CINCINNATI, OH -- A "zombie nativity" that spurred complaints and zoning violation notices last year is on display again in a suburban Cincinnati yard, with a change to avoid fines. Officials have concluded Jasen Dixon's display complies with local zoning laws because he has removed its roof. Sycamore Township zoning administrator Harry Holbert says the issue was always about the structure and zoning rules, not the zombie figures. The scene includes a sharp-toothed, grayish figure with black-ringed eyes sitting in the manger where the baby Jesus would be in traditional Christmas nativities. Dixon was threatened with fines last year when officials said the display violated rules on size and placement of yard structures. WCPO-TV reports he removed it before being cited and didn't have to pay fines.